If any band is a poster child for turning the power of positive thoughts and intention into reality, its the explosive horn-and-percussion trio Moon Hooch. 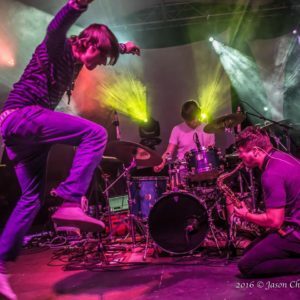 In just a few short years, the groupWilbur, fellow horn player Wenzl McGowen, and drummer James Muschlerhas gone from playing on New York City subway platforms to touring with the likes of Beats Antique, They Might Be Giants, and Lotus, as well as selling out their own headline shows in major venues around the country. On Red Sky, their third and most adventurous album to date, the band uses everything theyve learned from their whirlwind journey to push their sound to new heights, bringing together the raw, transcendent energy of their live performances and the sleek sophistication of their studio work into a singular, intoxicating brew that blends elements of virtuosic jazz, groovy funk, and pulse-pounding electronic dance music. A Shadow of Jaguar is a high energy rock n roll duo based in Brooklyn, NY.